Winter hit us very hard this year. We already have more than two feet of snow on the ground and, as I’m writing this blog, it’s snowing outside. The temperature has also dropped down below zero for a couple of nights and hanging below 20ºF most days. As much as it is harsh for us, it’s much more difficult for our winged friends. We depend on them to handle garden pest control and they have been doing a great job. It’s only fair for us to provide some comfort for them when food and fresh water is hard to find. 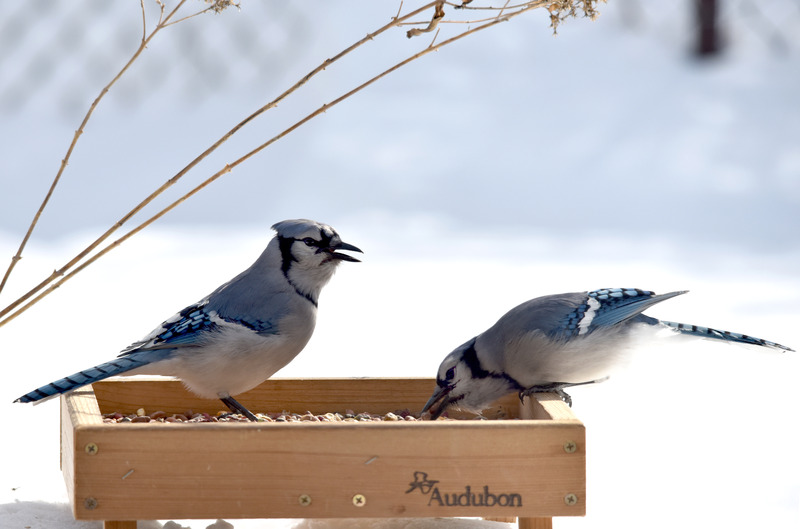 Since we provide food, water and roosting places, when the winter gets really bad our yard gets very busy. This year is even busier since the Pine Siskin are here. They would come around once every few years when their food is hard to find in the sub-arctic boreal area. There are so many of them that we have to fill the main feeders in the garden three times a week in order to keep up with their appetite. We leave the feeders in the garden but remove the ones on the patio every evening so as not to draw in skunks and raccoons. 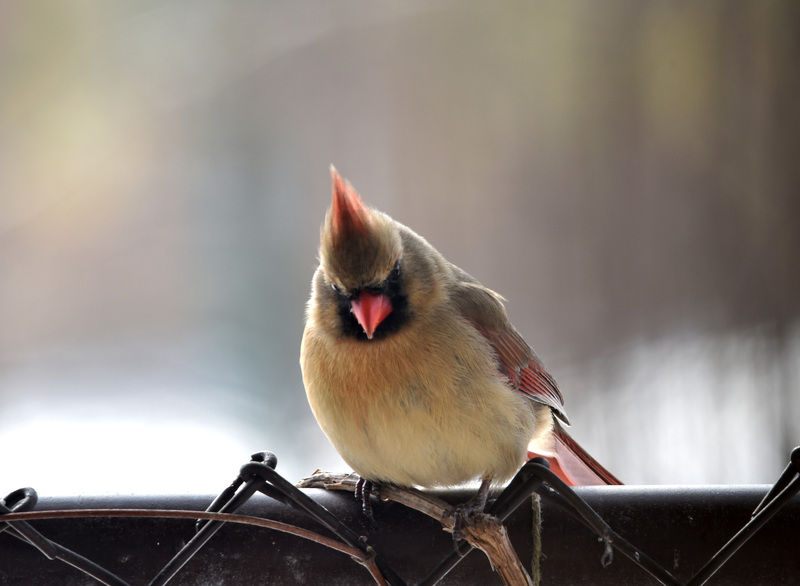 Every morning I see the birds line up on the fence waiting for us to put the feeders back. It’s a wonderful sight. 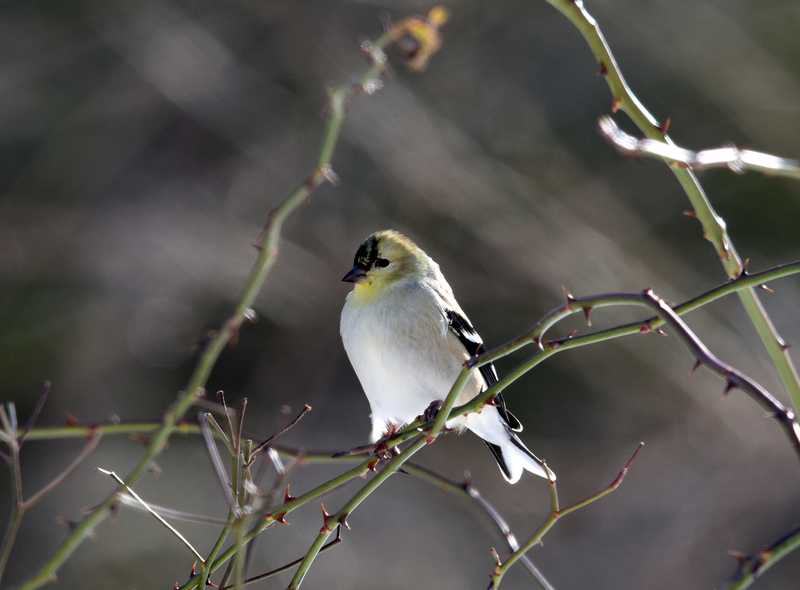 I wonder if this male American Goldfinch (Carduelis tristis) knows something that I don’t. He’s starting to molt and getting his black patch on the head back. 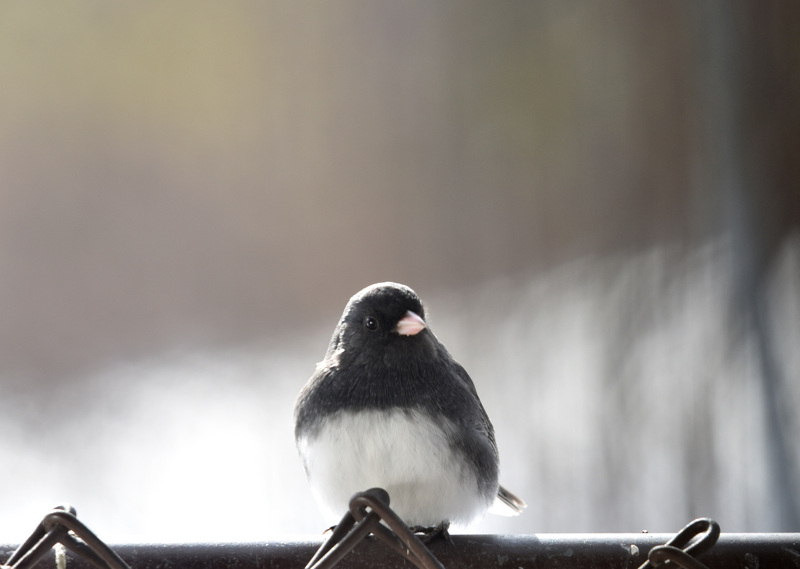 The male Finch shed their winter down when spring comes and turn bright canary yellow in summer. 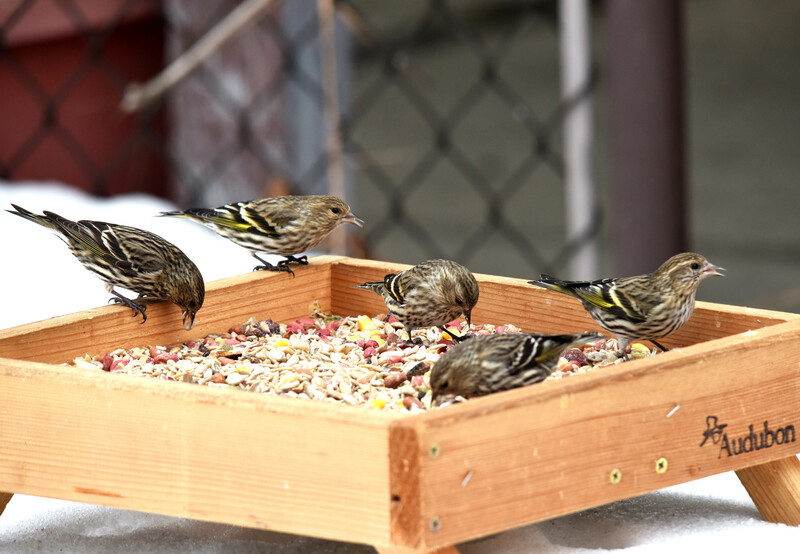 Several of the finches have developed some bright color and black head patches now. Either they are fooled by the temperature swing or spring is just around the corner. 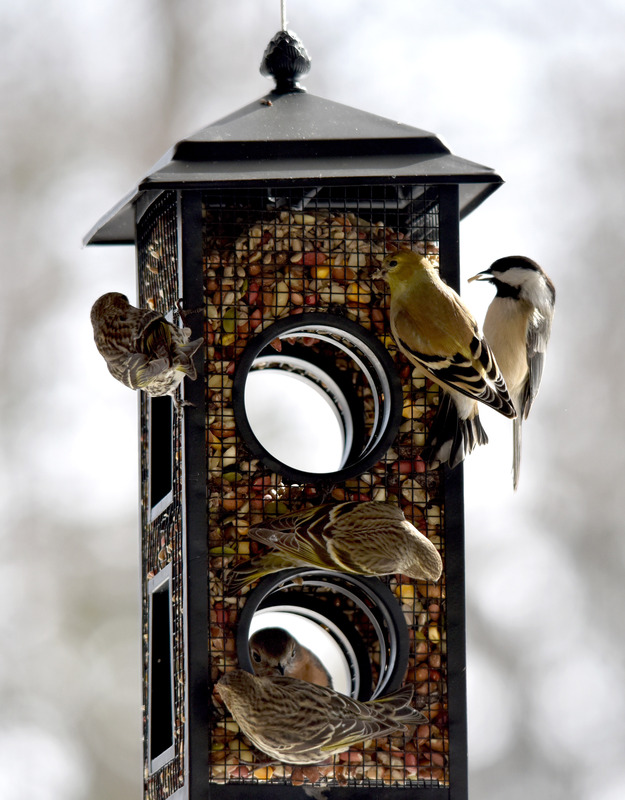 Pine siskin (Carduelis pinus), American Goldfinch, Eastern Bluebird and Black-capped chickadee sharing a feeder. 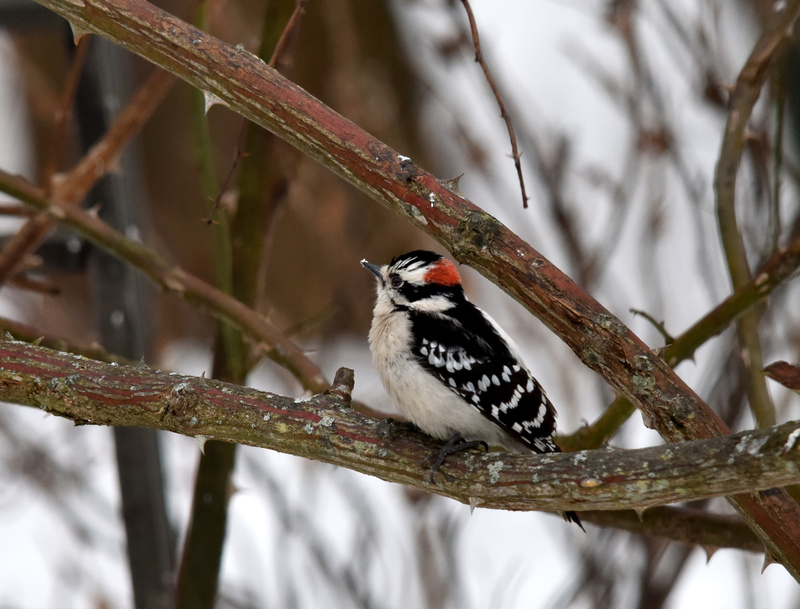 We have plenty of Downy woodpeckers (Picoides pubesceus) and they are not as wary of us as the other woodpeckers. The Red-bellied and Northern flicker woodpecker are very camera shy. The Pileated woodpeckers (Dryocopus pileatus) have never come to the feeder. The one above was pecking on the maple tree in the front yard. 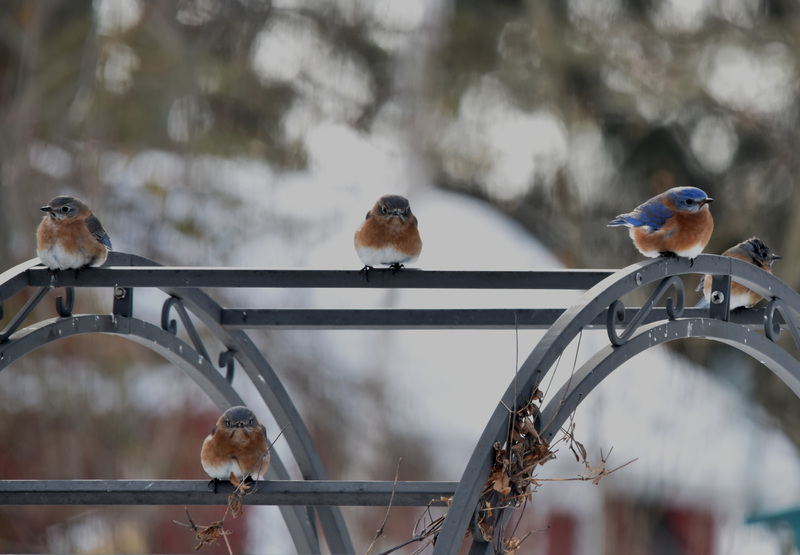 These five Eastern Bluebirds (Sialia sialis) were waiting for their turn at the feeder. We see them more and more in winter. We assume that either we have plenty of food and shelter to offer or they were born here and feel comfortable being in the yard instead of migrating south. By religiously monitoring the nest boxes, we managed to raise one to two broods every year. 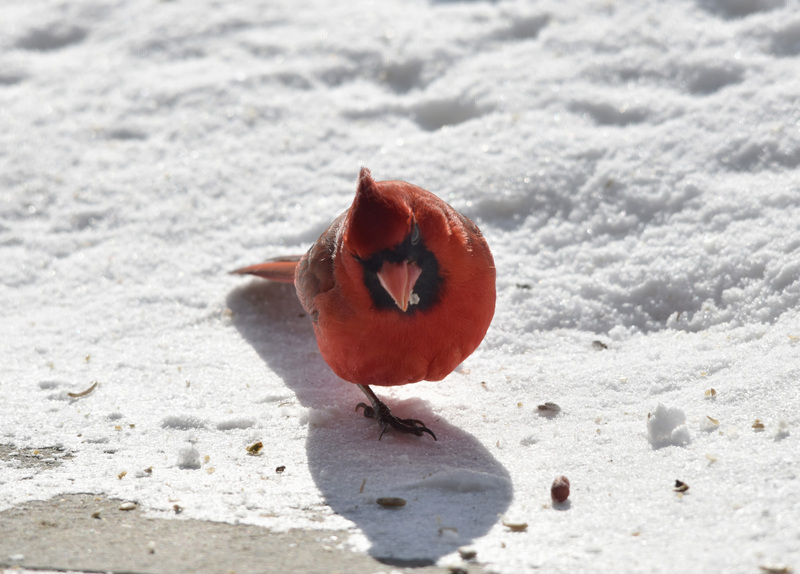 Nothing wrong with this male Northern cardinal (Cardinalis cardinalis). It was so cold that he alternately tucked one foot in while feeding. 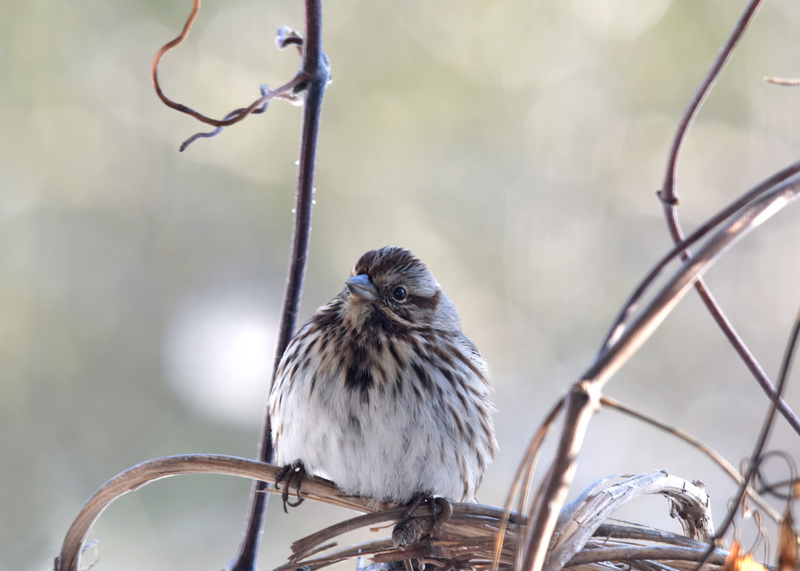 Many of the birds either do this or just sit on both legs to keep them warm like the Song sparrow (Melospiza melodia) below. 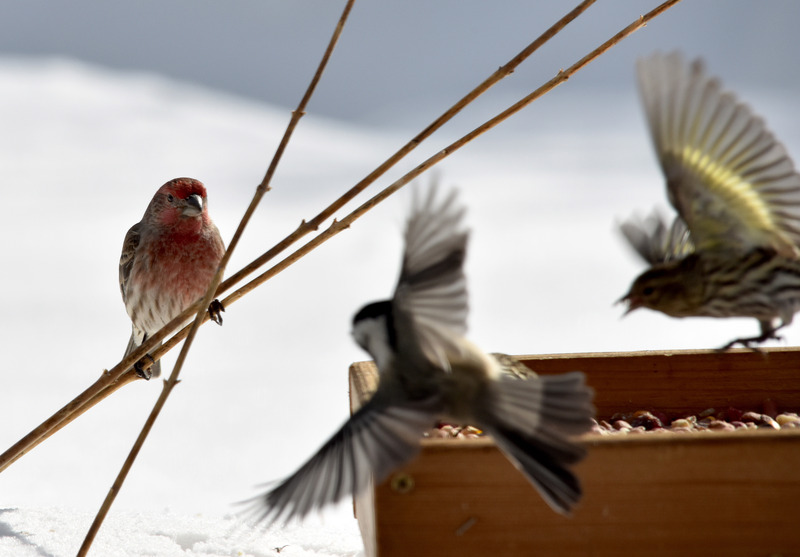 House finch (Carpodacus mexicanus) waiting his turn while a Pine siskin defends his space from a landing Chickadee. Some photos are not much in focus since they were taken through two panes of glass. Sitting in the blind wasn’t an option when the temperature was below 20ºF. What a wonderful display. You must be a life saver for those birds. Thanks. We love them and treasure their bug patrol work in the garden. We thought this was the least we could do for them. I loved seeing your bird life. I love Pileated woodpeckers. Sorry you’ve had such a fierce winter. We’re supposed to get a tiny bit more snow today but the worst part is the cold temperatures. Seeing what has happened in Boston, I’m not complaining about the weather. I just feel bad for the animals around here that are having a very tough time finding food. 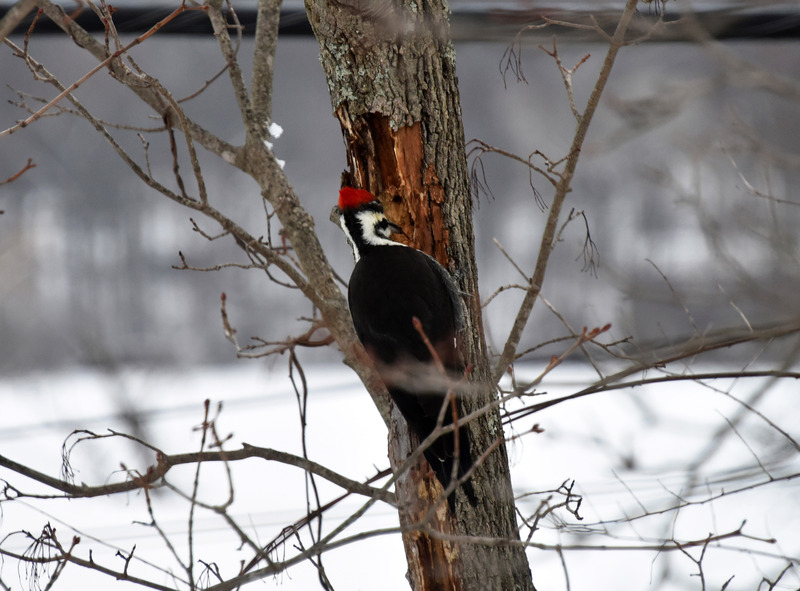 The Pileated woodpecker is pretty majestic but they prefer to stay in the woods rather than coming to the feeders. What a beautiful variety of birds you have and yes it is a two way relationship we have with them. You really said it all. We depend on them here both for bug patrol in the garden, for their color and for the symphony they deliver in nearly any weather.